Beware of the words 'Industrial Strength' in the description! Many eBay sellers are putting the words 'Industrial Strength' in their listings descriptions, when in fact, the machines they are selling are NOT. The scarier thing is that when they are made aware of the error, they REFUSE to change it, deliberately choosing to deceive potential buyers! Simply look for any vintage sewing machine on eBay, and you'll see it for yourself. There are many makes and models of vintage and antique sewing machines on eBay. There are many people, including sellers, who know NOTHING about these machines. Often times buyers do not know what to look for, and trust in the sellers listing that what they are buying is actually what they will get- however, this is sometimes not the case. 1. Know WHAT KIND of machine you need. What type of sewing do you want to do? Most times a heavy duty domestic sewing machine that has both zigzag and straight stitch functions are all you need. 2. KNOW the difference between' Industrial ' and 'Domestic' models. Many times sellers list that the machine they are selling is 'Industrial', and it clearly it's NOT. 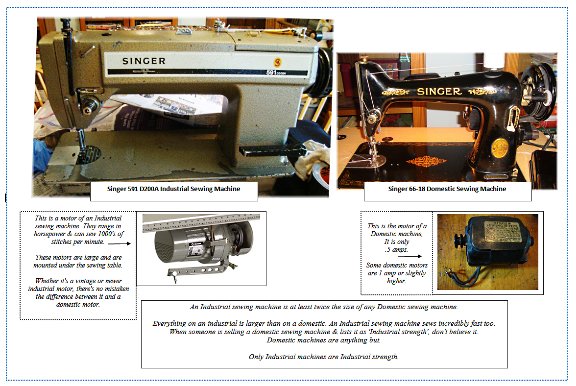 Do yourself a favor and Google: 'Industrial VS Domestic Sewing Machines' and you'll find a lot of information and will instantly see the difference. Sellers either don't realize the difference themselves or they simply lie to sell a machine. It's been my experience that even when you inform a seller that the machine that they are selling is not an industrial, they refuse to correct the information. That's very dishonest. Industrial machines are at most times, much larger than a domestic machine.The motor on a domestic machine is measured in amps, and an industrial machines' motor is measured in horsepower. The motor for an industrial machine is much larger than a domestic motor. Domestic machines were made for home use, whereas industrial machines were made for various large scale manufacturing purposes. 3. READ the description carefully. Does the seller add a lot of detail about the condition of the machine? What is the condition of the wiring? Does the motor work? Do all functions work? What is the condition of the decals? The condition of the machine itself? Is there any rust? Does the seller provide a lot of pictures from every angle of the machine? Does the seller claim it's just 'been serviced'? or that it 'works'? Buyer beware, if a seller is serious about selling a sewing machine, they will add as much detail as possible about it. A real good seller may even include a video of the machine in use which is a big plus. 4. Check their feedback. Always read a sellers feedback. Is there a pattern of slow ship? No communication?, etc. Will the seller insure the machine? All of this matters or in the end you may be left with a big headache. Need advice on a sewing machine? Contact me. I answer all emails same day until 5pm EST.